After signing HB 3391 into law in August (a bill that forces insurance companies to cover abortions with no co-pays or deductibles), national media hailed Kate Brown as pushing the most progressive abortion legislation in the nation. But pro-lifers on the front lines in Oregon know that Governor Brown has been an abortion extremist her entire career in politics, supporting abortions even up until the moment of birth. Brown was first appointed to a vacant seat in the Oregon Legislature in 1991 after having worked as a lobbyist for the Women’s Rights Coalition—a group that supported late-term abortions. Planned Parenthood refers to Governor Brown as a “legislative champion,” recognizing that even when she served in the Oregon Legislature from 1991 to 2009 she was known as abortion-rights extremist. Brown even sponsored a bill that would have shut down pregnancy resource centers had it passed (PRCs provide care and assistance to pregnant women and babies at no cost to taxpayers). 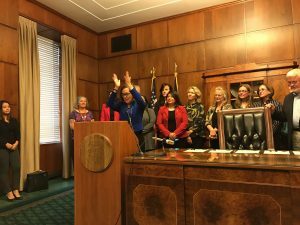 Fast forward to this August when Governor Brown signed HB 3391 into law, making abortion free for nearly every woman in Oregon. This bill allows for up to $10 million in taxpayer funded abortion for undocumented immigrants and forces insurance companies to cover abortions with no co-pays or deductibles. The so-called religious exemptions are extremely narrow and, in any case, provide for the state to pay for abortions for anybody on an insurance plan exempted from covering abortions. Kate Brown’s ceremonial signing of this bill on Monday was another attempt to make a statement about her extreme position on abortion. Although the bill was already made law, she chose to celebrate rather than mourn Oregon’s legal killing of the unborn—even those months, weeks, days or even minutes before birth. Oregon needs a governor who, rather than advocating for laws to allow the killing of the unborn, will be an advocate for all Oregonians, even the unborn. You have abdicated your right to be Governor. You bypassed your constituents by passing #3391. I will work along with my friends to remove you from office. We hope to see you at our rally in Portland on January 14, 2018! I will Vote a Straight Republican ballot this Nov Midterm. Kate Brown needs to Go and Not be the future Gov of Oregon! Oregon becomes the chief baby-killer state with a baby-killer governor, forcing its citizens to pay taxes that will pay for the slaughter. Oregon citizens must be proud of being baby-killers. If not, they’ll vote her out. Oregon – a baby-killer state. OH MY GOD!!! Kate Brown, Oregon Governor, in the winter of 2017, has legislated murder into state law, with aspirations of enacting the same into federal law! Late term abortion up to the moment of giving birth is murder! In Oregon, when a woman goes into labor, she can now legally make this decision: “Should I deliver my unborn baby, or murder it as it tries to exit the womb? * This is considered “Planned Parenthood”? It is planned murder! Premeditated!!! Does the father of an unborn have a right to protect their unborn child’s right to life, or not? No. If a person commits an act of violence against a pregnant woman, and causes the death of the unborn child, they face at least manslaughter charges for the DEATH of the child. How can an unborn child’s rights be on one hand defended by especially federal law if killed by anyone other than the mother as manslaughter, but if the mother chooses to kill their unborn baby even at the moment of delivery in OREGON, it is deemed Planned Parenthood in action, not premeditated murder? How can a state legislate murder into law, over federal laws protecting unborn children’s lives, ESPECIALLY from late term, third trimester “abortion?” This is state sponsored murder, depending on who causes the death of the unborn child. How is this any different than the planned genocide that Hitler did with Jewish people in Auschwitz? That was just very late term abortion for the Jewish people, “on the house” as a courtesy from the German state. Now so we have the Oregon state sponsoring and funding genocide of all races. No discrimination here. If/SINCE her position is unchanging for such a long period of time, and because she “Obviously” must have “Witnessed an Abortion” or Two or Several and thereby “Continues” in her profession of exalting the “Mother’s Rights” above those of the “Father”, and/or because she’s “Well Informed” of such Barbaric Practices in-fact “CONDONES” them, one can only “Properly Deduct” Ms. Brown’s mind is equally “Demented/Psychotic” having seen such “Operating Room Results of Dismembered Infants” and is therefore “NOT” vehemently “AGAINST ABORTION/SELECTED MURDER” for no right minded person would ever/COULD EVER DO SO!! NO!! Ms. Brown, You are not a “Champion for Women’s Rights”–YOU ARE A HATER OF WOMEN’S FREE RIGHTS THROUGH PROPERLY INFORMED TRUTHS! !